This is our first challenge at Creative Card Crew with Mari! I want to thank Mari for taking on the challenge blog when Janna retired. Please welcome our the new owner of Creative Card Crew! Janna we will miss you! The new challenge is "Animal Antics" so link your animal card creation HERE! to use on our cards for this challenge. I used "Fairy Iris" to create my card. I really love your card! The colours are fab. Great card using some beautiful summery colours and a gorgeous image! Beautiful summer colours you have used for your card. And a sweet image. Thank you for joining our challenge at DDCC this week. And good luck. Another fab card, Thanks again for entering our challenge at ALLSORTS this week, good luck & hope you’ll join us again! Thanks for joining us this week at Totally Papercrafts. Good luck. Lovely card in such beautiful colors. You did à great job coloring! 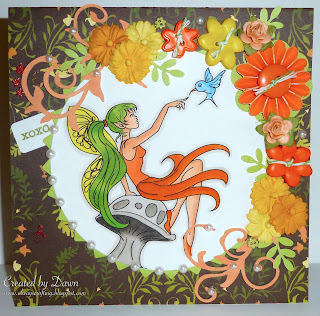 Thank you so much for joining us at Stamptacular Sunday Challenge this week. Beautiful work - thanks for joining the MTTC Challenge this week.